The beauty of the popularity of Hazel Green outdoor kitchens and living spaces is that the options seem limitless. You can finally open up or extend even a smallish house in order to make it into anything you want. Ironically, give someone unlimited options and this can suddenly seem too much; sometimes limitations help people make better and more secure choices. So in order to avoid that feeling of being overwhelmed, it is a good idea to have some creativity thrown your way. This way you can pick and choose until you narrow it down to what you might like. So some ideas you will love and some you will hate. But it is all about moving you towards making a decision you can live with at your own home someday. You may already have pictures cut out of magazines or Pinterest boards full of what you want to do with an outdoor living space. Either way, here are some things to think about before making a choice. Add Fire – If you create an outdoor space you should be able to enjoy it as much as possible. Yet without a heat source, your nights of enjoyment will be limited by the local Hazel Green weather. But not if you add fire. This is especially important for anyone who does not have a fireplace inside their home. Mix up seating – make it comfortable and multifunctional for different moods and occasions. Tableside seating is ideal for dinning, bar style seating is perfect for after dinner drinks and an outdoor sofa is great for getting comfortable at any point. Include cooking options that don’t work indoors – if you can’t grill inside because of the smoke, get out of the kitchen. At least the indoor kitchen that is. Allow the possibilities to expand based on the fact that you no longer have to worry about setting off the smoke alarm or not having enough room. Consider roofing and shielding the view – Being outdoors certainly means being free from interior limitations but a few touches can make things nice outdoors, too. For instance, having part of an area covered by a roof overhang means having a place to still chill out when it rains. And shielding some of the view with stonework or plants means giving you and your neighbors some still needed privacy. 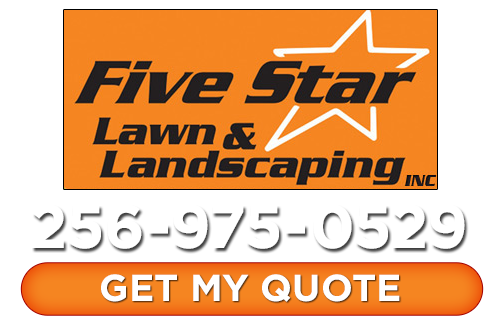 There are countless ideas to ponder and at Five Star Lawn and Landscaping, Inc. we want to be part of making that happen for you. 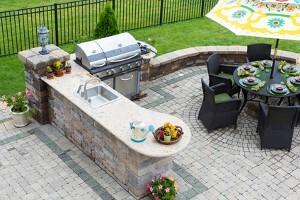 We look forward to kicking around ideas and drawing up designs for your Hazel Green outdoor kitchen and living space. If you are looking for Hazel Green outdoor kitchens or living spaces, then please call 256-975-0529 or complete our online request form.